It’s a message that everyone needs to hear! That God is love, that Jesus loves you, and that we are to love one another. Valentine’s Day is either looked forward to or dreaded by most. Good relationship with lots of romantic feelings? Good day. Not in a relationship, hurt by someone, alone? Worst day ever. But it occurred to me a a number of years ago, when I was trying to decide what I wanted to teach my children about this day, that it can be one more opportunity to point them to Jesus. And so when I started painting a couple years ago, I created these sweet (lol… see what I did there?) little cards, a set of six, that I have framed to display in my home. I don’t know yet where I’ll put them this year (our home is ever being renovated, so each year my set up is different), but that’s not really the question you need to ask yourself. The question you need to ask is where will YOU put them? That’s right, I have created printables for you! Yey! Whether or not you are excited about this, I am! I just love to share my artwork, and since I’m not in a place to start an all out business and sell them, that means I get to give them to you free! 🙂 Assuming any of you want them. But that’s a whole other question. 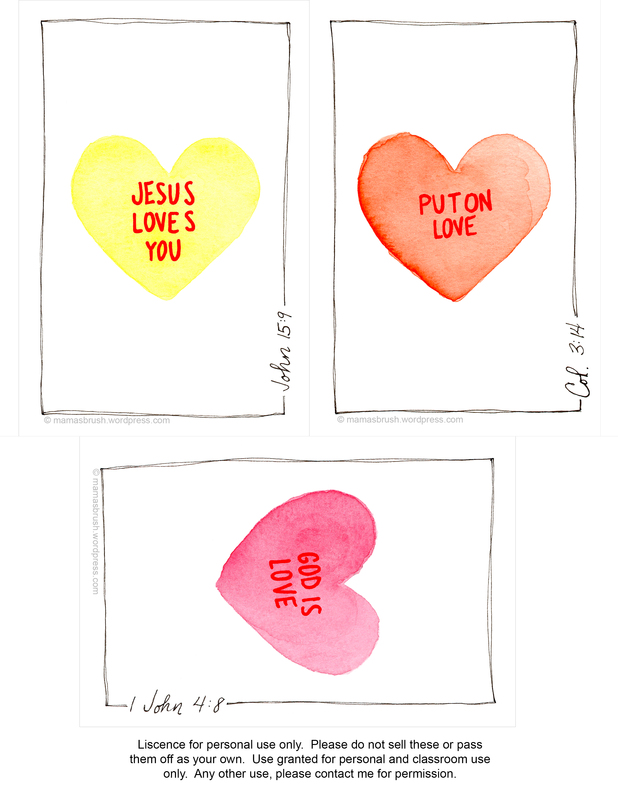 So here they are, 4×6 prints and Valentine sized for giving to friends. Just write your “to” and “from” on the back with whatever message you want to include and spread the message! 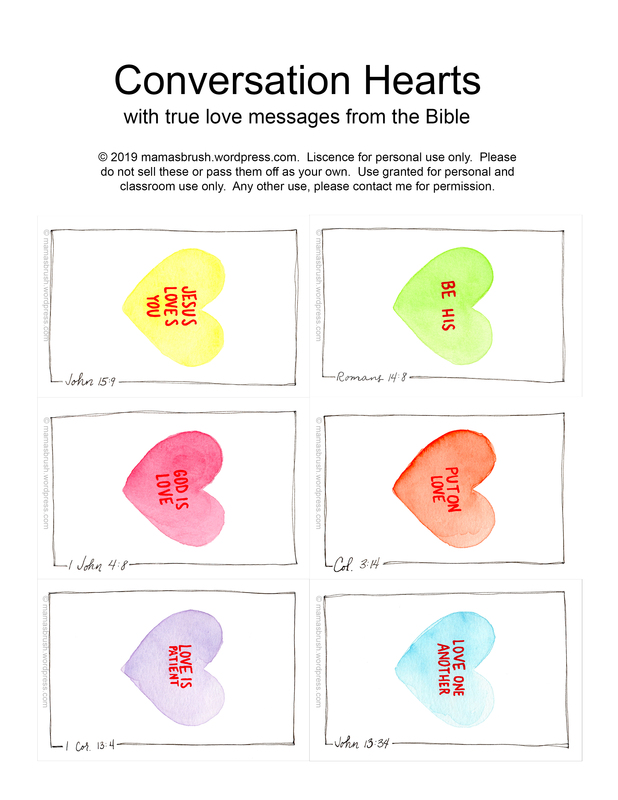 Download this 8.5×11 Conversation Heart Printable. There are cutting guides printed around each one. Speaking of spreading the message, will you help me? I haven’t found much of this sort of Valentine decor and cards around and I’d like as many people as possible to have access to them. Would you please share this post on social media? Pin it, tweet it, post it somewhere. Do it yourself or click on the share it buttons at the bottom of the post. I’d really appreciate it! 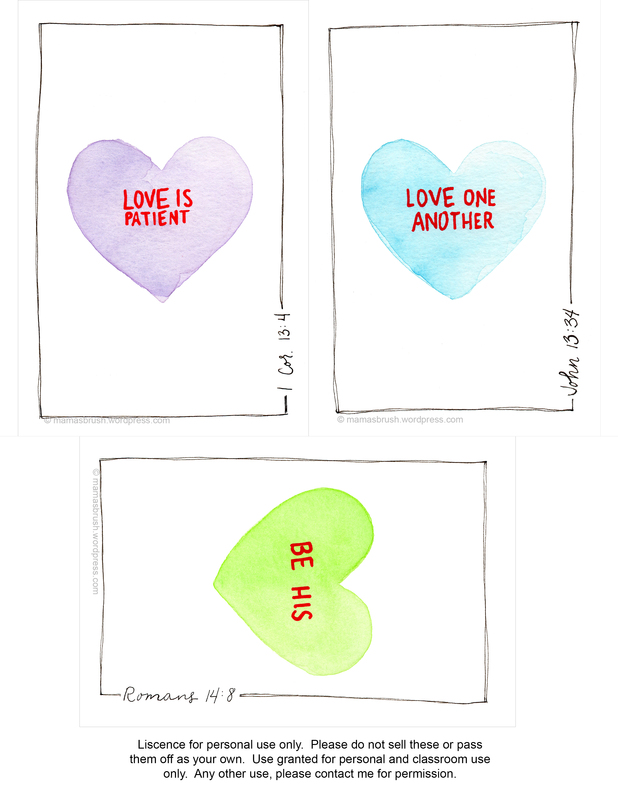 Download these 4×6 printable Conversation Hearts. They print as an 8.5×11 sheet of paper. Instructions: Just click on the links in the image captions below to get to the image all by itself, right click and “save image as”. Then just save it on your computer in a place where you will find it. You should then be able to print it. Just make sure to select the proper size when printing . ***Official legal stuff: Copyright remains my own. Please only use them personally or in your classroom. Print them and give them as gifts. But please don’t distribute them online or claim them as your own. If you want to share them on your own blog, please be sure to give me credit and include a link back here. Thanks! They are my original work and I’d like to be able to continue sharing what I create with you all. Go forth and share the message of God’s love with those around you! I read that they went bankrupt and had to stop production. A new company bought them and plans to produce the hearts but it was too late for this year. Thanks for leaving a comment! It is a real encouragement! I’m glad you like my heart’s! I’m so glad! Thanks for taking the time to tell me so! Very cute hearts with a positive message for the whole year. We will feature this post on the next Blogger’s Pit Stop. Well done. These are wonderful. Thanks so much for sharing them! I’m featuring them at Thursday Favorite Things tomorrow! Ah! Thanks so much! That means a lot! I love these prints. They are so beautiful. Please stop by Over The Moon Linky Party since you are being featured. I hope you will join us again this week. Have a blessed and Happy Valentine’s Day! Thanks so much. It was so sweet of you!